There are things which happen in our lives that can only be understood within the realm of the miraculous. We simply have no rational explanation for these moments where the impossible interrupts our known universe. Now we believe that the world is round and revolves around the sun. But there was a time when such notions were regarded as mad impossibilities. This book holds an impossible story in which the dead speak and herald miracles of forgiveness and transformation. I cannot blame you if you find it unbelievable: I would not have believed it myself two years ago. But suppose for a moment it isn’t madness. Suppose that a man can accompany his wife through her final earthly passage from the other side of death. Suppose that another man while in a coma can meet spiritual helpers who illuminate a realm of forgiveness and hope so powerful that he awakens and returns transformed to heal his family before leaving his earthly life. What would these possibilities mean to our lives, and even our world? That we are eternal souls on a mortal journey, that life and love and healing are infinite … that eternal joy is each person’s birthright and destiny. I ask you to take this unbelievable journey with me. Because it happened, and I was gifted to be a messenger of spiritual guidance that is unspeakably beautiful and wise. I have spent large portions of my life waiting on inspiration. What I have come to understand is that some of the projects that feel the most meaningful require so much effort that they can only be accomplished with support from what I call Spirit. Sometimes I’ve named this spirit God, and sometimes I’ve thought of it as deep inner guidance. These days I have the sense that there are spiritual friends who help me on my journey. I think of a heron, stick-still in shallow water, whose patience is sometimes rewarded with succulent catch. After waiting until the buzzing thoughts have tired of themselves, sometimes I sense a loving presence nearby. Listening with my heart, I seem to feel a message. I have learned that if I write as I receive these thoughts they often continue unedited by my own mind. After two years of waiting, listening, and recording these messages, I received a new and unexpected initiation: a journey through the veil of death. At the beginning of the journey I only imagined the possibility that the dead can communicate with the living. I was relatively new to the notion of “channeling” spiritual messages. In a sense this one year was a crash course in the continuing nature of life and in the awesome power of love. In a strange way this book about the death of my father and step-mother and my children’s father is the most joyful thing I have ever done. Along with exhausting waves of grief, there have been exhilarating revelations whose white light has blasted though my prior conceptions of death as ending and life itself as finite. Imagine knowing that your loved ones are still present and available after death and that you are at all times surrounded by a host of spiritual and ancestral helpers. Imagine believing that everything is made up of the unfolding creative energy of love: all forgiving, all healing … through death and beyond. Imagine that all things are possible in Love. 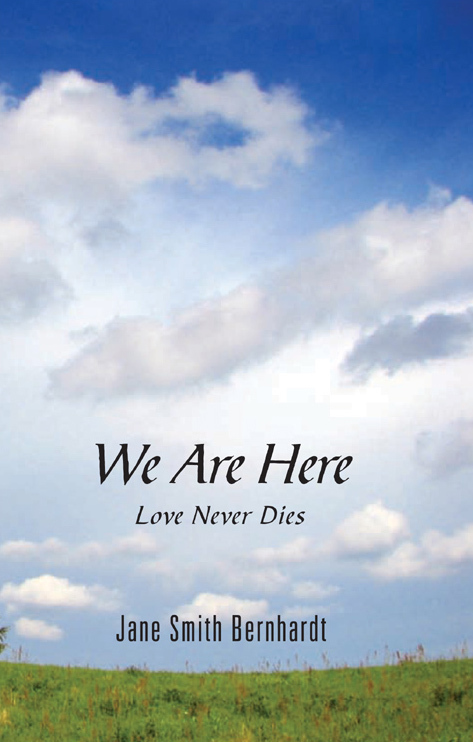 WE ARE HERE: Love Never Dies. 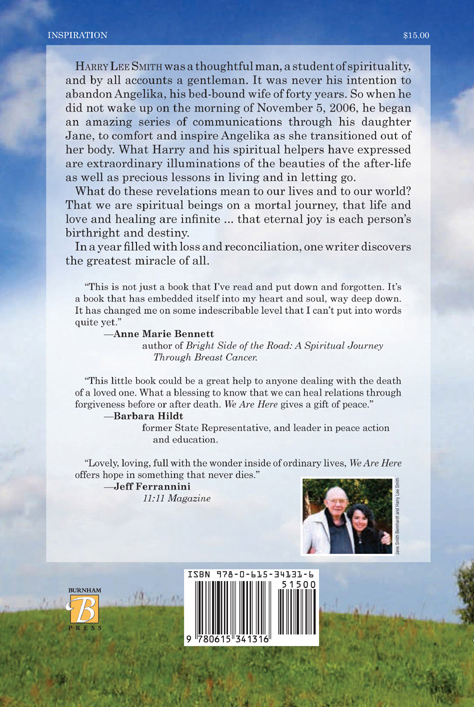 In this excerpt from my book, my father - in his “post-life” - addresses his bedridden widow, Angelika, and also the readers of our little book. He speaks about what is of real importance in this life in relation to the nature of Abiding Reality…. Angelika: I’m speaking to you and to Jane ... and Spirit Guides are joining me in this message. You have graciously entered into this sphere of divine receptivity and we are very grateful for your submission and acceptance of this high level of human attainment. What these helpers wish to articulate is a sort of accolade for a level so little understood within our society. And so we are going to elaborate on this, even though you yourself must already know much of what I’m going to convey through Jane. A flower allows sunlight and rain to help it to grow and radiate beauty ... and then it offers its nectar to insects for pollination. 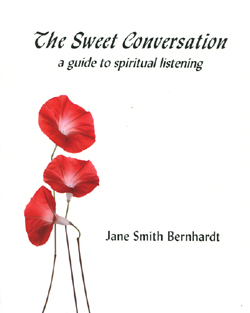 This is a great and beautiful service to the heightened realms of earthly sensitivity. A tree allows itself to receive light and provide shade; it offers its branches as a home for many other creatures. Indeed, if we look around ourselves, we see that pattern echoed throughout the earth: self-offering ... patience ... receptivity. Even those creatures whose task it is to move or carry, hunt or gather, are heeding spiritual impulses which guide them in their simple tasks. In this evolutionary moment, there is no task on earth more imperative than divine receptivity. It involves a revolution of perception. Yet this wisdom is age-old. Jesus said: “Consider the lilies of the field, who neither toil nor spin, yet even Solomon in all his glory was not arrayed as one of these.” He meant: Receive. Allow the universe to bless and endow your life as if there were a real and present God whose love is all-powerful and abundant. Here, in the realm of pure spirit, we can produce nothing that can be bought or sold. And for some, arrival here can be a rude awakening. “What am I to have and do?” they wonder, feeling a bit lost. Certainly, helpers will guide them. They will not wander aimlessly if they are willing to learn. But why not learn the most precious lessons now? Tune your soul to the frequency of love and enlightenment. Allow silence to blossom into wisdom. Train your heart to receive. How beautiful is the realm that waits to be received by you. Jane teaches and lectures on a variety of topics including spiritual guidance, portraiture, resistance and social transformation.